Time for a Goodreads Giveaway! My new novella will be ready for publication by the end of October, 2017. It is still in the editing stage and a cover design is being worked on. Steve Regan, a British undercover detective, is tempted by the riches of drug smuggling so he can be free of debt and petty police bureaucracy. He does one deal, which backfires, and he is shot and left for dead by Bill Morris, a Miami-based drug lord, but recovers in time to track down Bill, who is about to murder a London judge. This is the first in a trilogy of shorts featuring Steve Regan, undercover cop. Think James Patterson’s BookShots – short, fast-paced, high-impact entertainment. The kind of book to be purchased at the airport and devoured on the flight leaving a better taste than the in-flight meal! The author, Stephen Bentley, wrote an Amazon UK bestselling memoir ‘Undercover: Operation Julie – The Inside Story,’ a frank, sometimes humorous, account of his real life undercover days as part of one of the world’s largest drug busts. Bentley has now turned to writing fiction, and through that medium explores the duplicitous minds of organized criminal gang bosses and those who combat them in the name of law enforcement. I am excited by it and I hope you like it too. This is your chance to enter the giveaway and win a paperback copy of my new book. Even if you don’t win, I hope you go on to buy it when available in both paperback and Kindle versions. 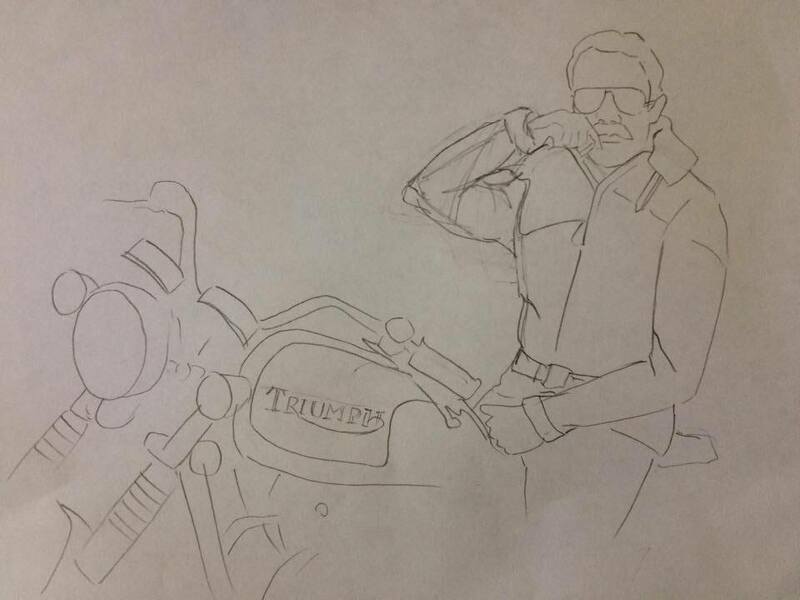 The featured image is an initial sketch of Regan complete with cool Aviators and astride a classic 1976 Triumph Bonneville T140 motorcycle. I will give full credit to the illustrator in due course when I write about the cover reveal. The giveaway is open to anyone resident in the United States or the United Kingdom. This is for shipping reasons. Please click through below if you wish to enter and good reading to you! Giveaway ends September 22, 2017. All 41 Amazon UK reviews of my bestselling memoir can be seen by clicking this link here.